Samsung Electronics, the world leader in advanced memory technology, today announced that it has begun mass producing the industry’s first one-terabyte (TB) embedded Universal Flash Storage (eUFS) 2.1, for use in next-generation mobile applications. Just four years after introducing the first UFS solution, the 128-gigabyte (GB) eUFS, Samsung has passed the much-anticipated terabyte threshold in smartphone storage. Smartphone enthusiasts will soon be able to enjoy storage capacity comparable to a premium notebook PC, without having to pair their phones with additional memory cards. Within the same package size (11.5mm x 13.0mm), the 1TB eUFS solution doubles the capacity of the previous 512GB version by combining 16 stacked layers of Samsung’s most advanced 512-gigabit (Gb) V-NAND flash memory and a newly developed proprietary controller. Smartphone users will now be able to store 260 10-minute videos in 4K UHD (3840×2160) format, whereas the 64GB eUFS widely used in many current high-end smartphones is capable of storing 13 videos of the same size. The 1TB eUFS also possesses exceptional speed, allowing users to transfer large amounts of multimedia content in significantly reduced time. At up to 1,000 megabytes per second (MB/s), the new eUFS features approximately twice the sequential read speed of a typical 2.5-inch SATA solid state drive (SSD). This means that 5GB-sized full HD videos can be offloaded to an NVMe SSD in as fast as five seconds, which is 10 times the speed of a typical microSD card. Furthermore, the random read speed has increased by up to 38 percent over the 512GB version, clocking in at up to 58,000 IOPS. Random writes are 500 times faster than a high-performance microSD card (100 IOPS), coming in at up to 50,000 IOPS. The random speeds allow for high-speed continuous shooting at 960 frames per second and will enable smartphone users to take full advantage of the multi-camera capabilities in today and tomorrow’s flagship models. 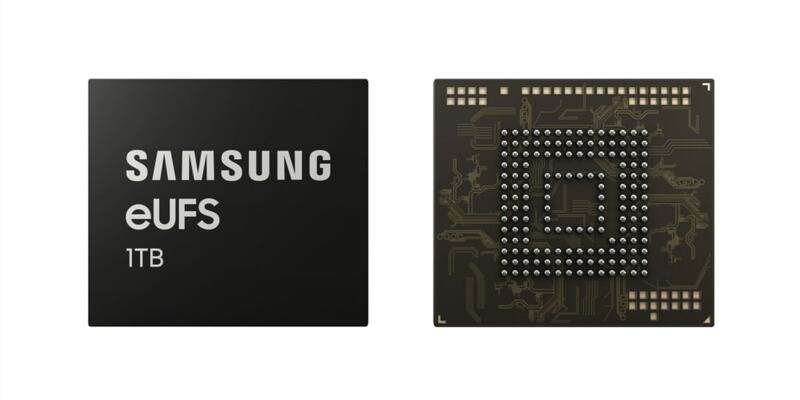 Samsung plans to expand the production of its fifth-generation 512Gb V-NAND at its Pyeongtaek plant in Korea throughout the first half of 2019 to fully address the anticipated strong demand for the 1TB eUFS from mobile device manufacturers around the world.